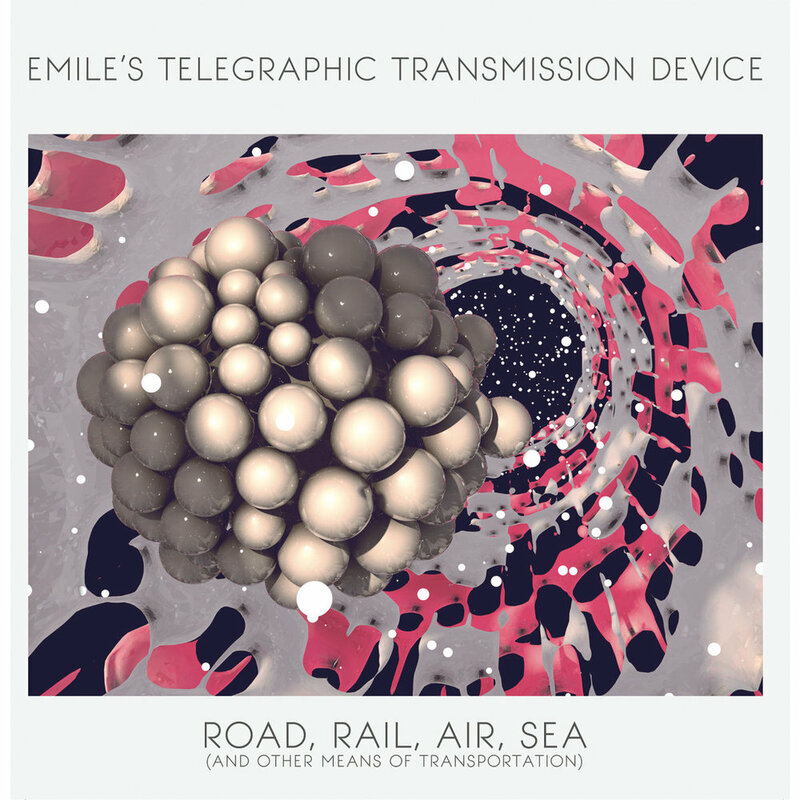 emile's telegraphic transmission device is the debut album. it was released on october 19th 2012. it spawned one single, radio. doodlebug//v1 - is the opening track of the debut album. it was inspired by the german unmanned bomb nicknamed the doodlebug. it's name comes from the droning noise it would make, before falling completely silent prior to explosion. most parts of mainland europe were targeted during the second world war. trapped - is the b side to doodlebug//v1. dan's brother thomas plays guirtar on this song. tapestry - is the first sequenced song using the microkorg. concrete heart - was considered to be released as a single, however radio was being written during these talks and quickly made it into the favoured spot, leaving concrete heart as a b side. derwent tower - was written about a landmark brutalist building that used to be situated in dunston, gateshead, england. it has since been knocked down after falling to ruin. radio - is the first and only single taken from the debut. it was inspired by omd's electricity, which in it's own right, was inspired by kraftwerk's radioactivity. magnetic words : part one - was written entirely on the microkorg, using patches and arpeggiators. magnetic words : part two - is the follow up to part one. it sampled the voice of peter oakey who was known for his stories of the war. ambivalence in motion is the second album. after a year of reocrding, it was released on april 14th 2014. it spawned one single, lady windermere. this album is considered to be the most known record, having touched on several political and anti-royal themes. it also gained much radio airplay on the bbc during 2014.
lady windermere - is the first and only single from ambivalence in motion,. it was recorded between august 1st and august 13th 2013 and was inspired by the famous oscar wilde play of the same name. it was re-released on 7" vinyl for record store day 2016.
coalition - is the second song on the album and the last to be recorded during sessions. it was inspired by the travesty and chaos caused by the coalition government in the uk during 2010.
victory? - is a song written about the leadership of margaret thatcher. it questions everything she had ever done and responds to the impact her government had on the industrial working class towns of north east of england. it was written after her death was made public. it was written by williams and james cockerill. this chaotic serenity - is another politically influenced song, this time questioning wether things will get better if the conservatives were to be kicked out. the establishment - was written around the birth of prince george. it's themes deal with how we are to be expected to conform to the norm by showing interest in the affairs of the royal family, the government of which it represents and how we are no longer free to do as we wish as we are always being monitored. in pripyat - was considered as a single. it was the first song to be written during ambivalence in motion sessions. it opens with a sample from news reports during the explosion of a core reactor in a nuclear power plant, chernobyl, pripyat, in which many lost their lives or fled away from the toxic exclusion zone. voyager - is a song originally written on piano. it was translated to synthesiser and deals with the subject matter of the voyager satellite. road - is the opening song on road, rail, air, sea (and other means of transportation). it features john timney on drums and percussion. it was recorded at the punch room (vocals, synthesisers and programming) and loft studios in newcastle upon tyne (drums). rail - is the second part of the main title. it uses found sounds recorded at both durham train station and the metro system outside of university campus in sunderland. air - follows up seamlessly from rail, with the use of airplane noises. the vocals were double tracked on this recording. sea - was inspired by the sinking of the rms titanic in 1912. it uses sounds of radar and sub bass notes to create an underwater atmosphere. some guiness glasses were smashed for this recording to emulate the sounds of plates and glass smashing during it's sinking. it's lyrics are written as a love verse to the ship, referring to it as 'her', as most ships were / still are this day. ephemerally yours, industry - was written and composed by john timney. for heroism and sacrifice - was written using tom tom drums. it's simplistic bass line leads into the song, with melodicas building it up to it's crescendo. marie curie - was written within ten minutes. it had a music video, which was subsequently shelved on vhs. the tape has since been lost. state of war / overthrow - is the first song by ettd to be written in waltz time. it deals with the subject matter of north korea and it's leader kim jong un. it asks of him to hand in his key, to let his people live as the rest of the world does. it also asks him not to inflict war upon countries who wish to remain peaceful. gravity on our side - is a non sensical song. it was released as a b side. the start of everything - is an opener to all that may happen. it is not a composition, but a statement to resemble the beginning of time, history and indeed the record. it is a sample, taken from the work of physicist john cramer. i could never - is the first single from all that may happen. it was recorded on january 1st 2015.
inferno - was inspired by a photograph from the late 19th century. it featured five women on what appeared to be a stage set for a rendition of dante's inferno. in the photo, one of the women seem to be out of place and the song questions her situation. it is written in waltz time. call waiting - is an experimental track using recordings of phones and answering machines. may i take your call? - questions the use of telephony in the modern age. during writing, dan was working in a call centre. a job he did not enjoy. cruel mistress - deals with the subject of homelessness and how it should not exist in the 21st century. utc - is an experimental piece using speak and spell samples, set to the sound of a clock going exactly at 60 BPM. cvthbvrtvs - is a song inspired by the life of bishop cuthbert of durham, who's body parts upon his death were seperated and transported to lindisfarne (holy island) and durham cathedral. the foot steps at the beginning of the record were recorded in durham cathedral. ground zero (i) - deals with the impact of terrorist attacks in new york on september 11th 2001.
ground zero (ii) - is a follow up of it's previous track. it features samples from both american and british news coverage. the sound of nothing - is a small track that was originally to be a spoken word electronic voice. however on an off chance, dan recorded the words he had written and sung them onto the track, it's background consists of two synthesisers and a field recording of a construction site. heritage - is the closing song. it deals with the closure of coal mines in the uk and criticises the conservative government's decision to leave coal miners redundant in the mid 1980s and 1990s. adoration, lust, condemnation & mistrust is the fifth album. it spawned four singles, stay, miles away, towards you against me and (everyday) a certain pulse. it has been compared to the band's earlier work with ambivalence in motion, often being dubbed ambivalence in motion part ii. it brings the band back to a non experimental, more conventional sound. it was released on june 1st 2017.
interlude - is the opening track and is a slower, more melancholy version of the melody taken from the album's closing track. stay - is the opening track to this album and is a crowd favourite at shows. it boasts an upbeat melody, sequencer, heavy bass riff and high range vocals. it is the first and only song by emile's telegraphic transmission device to be written with a dropped bass guitar string, changing the standard tuned E string to a dropped c#. it features bernie christie on backing vocals, recorded by john timney. stay is also the only song in the catalogue to use both a six string and twelve string acoustic guitar during the choruses, performed by john timney. into the shadows - was the last song to be recorded in sessions for the album. miles away - deals with the aspects of long distance relationships. during the reprise of the last verse, dan's voice slipped. it was left in the mix as no other take held quite as much emotion as that one. it was also written within one day. it was inspired by a short lived long distance relationship between dan and a woman from dortmund in germany. towards you, against me - is a melancholic pop song dealing with human emotion and abandonment. it also deals with fears of commitment. (everyday) a certain pulse - was the first song to be written. it was inspired by most 90's dance music and featured high levels of double tracking, particularly on backing vocals and choruses. it was recorded using a microkorg and roland fa06 synthesiser. lost in the ether is the sixth album. Released on 1st August 2018, it is dedicated to the life and work of Professor stephen hawking (1942-2018).